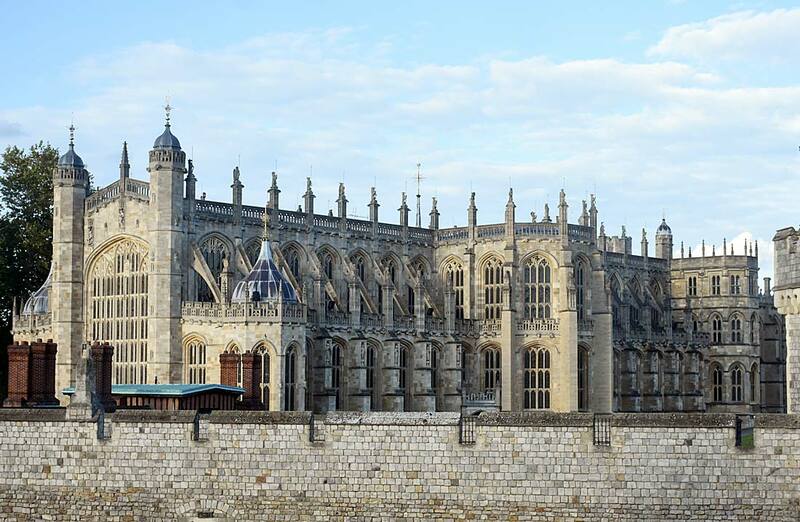 We’re so excited to have secured a hotel room overlooking Windsor Castle and St. George’s Chapel, wedding site for Prince Harry and Meghan Markle! Looking out our window at the The Harte and Garter Hotel, we peer over the castle walls into the sprawling grounds of the royal wedding venue. The view of St. George's Chapel inside Windsor Castle from our room at Harte and Garter Hotel. That’s the good news. The bad news is our hotel dates did not coincide with the royal wedding dates. Still, our recent visit to Windsor, England and our troves of photos of the wedding site are still exciting, whether you are a royal watcher or not. 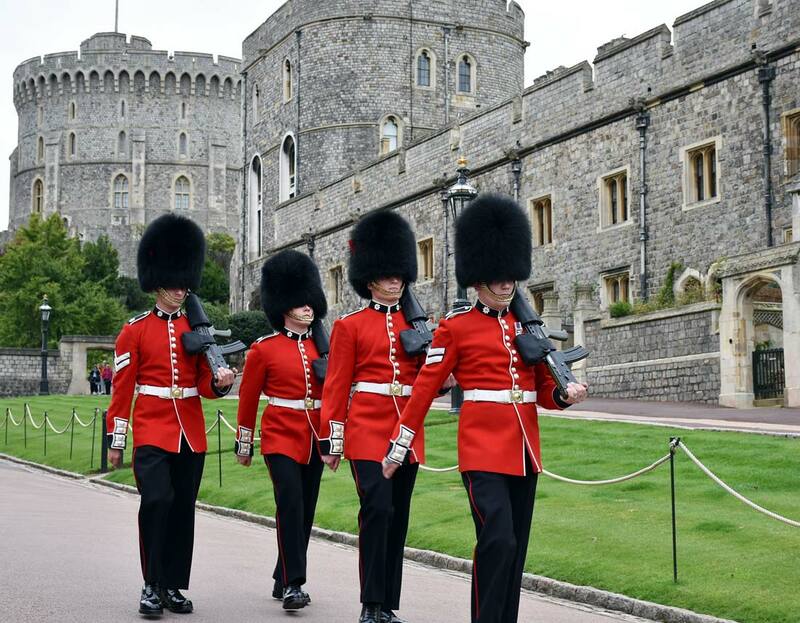 Wedding aside, Windsor is a great locale for immersing in England’s history, the royal family and enjoying a slower pace than in nearby London. Windsor is a $20 ride to Heathrow Airport, making it a great place to begin or end your next trip to England and the United Kingdom. 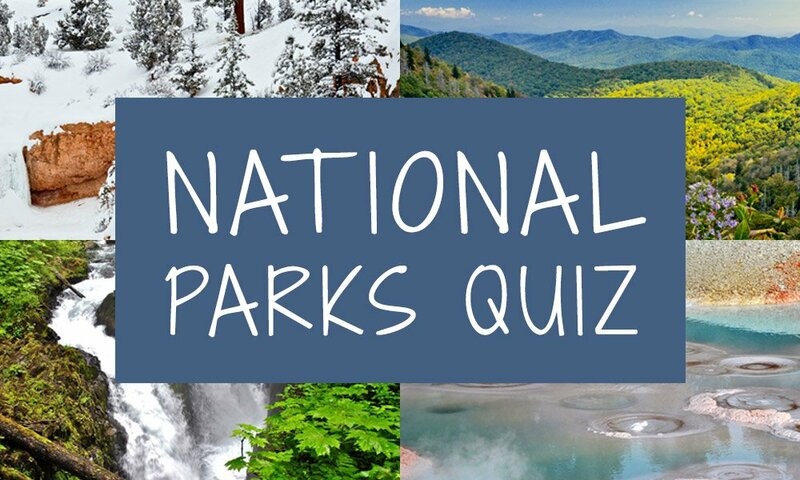 We’ve toured many castle ruins and castles that serve as museums. What makes Windsor Castle unique is its pristine condition and the fact that it is a fully working facility. Around 150 people live and work on the grounds. The historic town of Windsor, surrounding Windsor Castle. Queen Elizabeth II considers Windsor Castle her home and Buckingham Palace her office. She spends most weekends at Windsor. Wonder if she’s home during your visit? When in residence, her flag flies above the castle. Founded by William the Conqueror in the 11th century, it has since been the home of 39 monarchs. 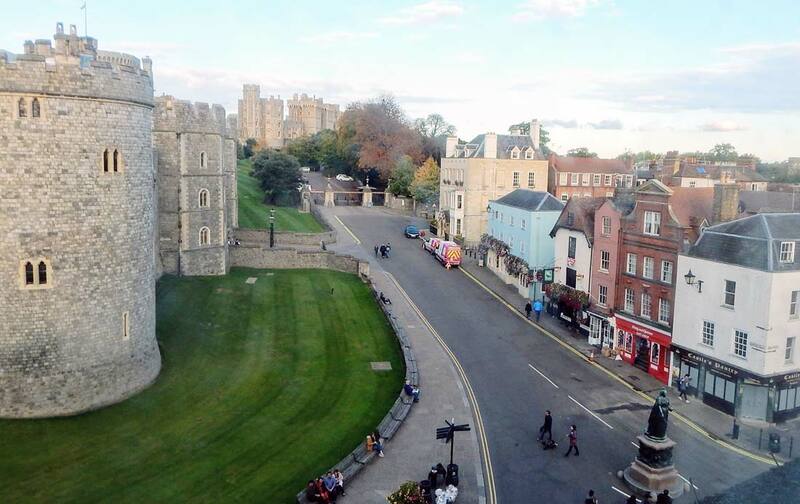 Windsor is the largest inhabited castle in the world and the oldest continuously occupied. Tour groups day trip to Windsor from London, so be prepared for a crowd. The beauty of staying in Windsor is we had the crowds from morning to mid afternoon and then the crowds went home and we were free to stroll the quaint historic town without the mobs. 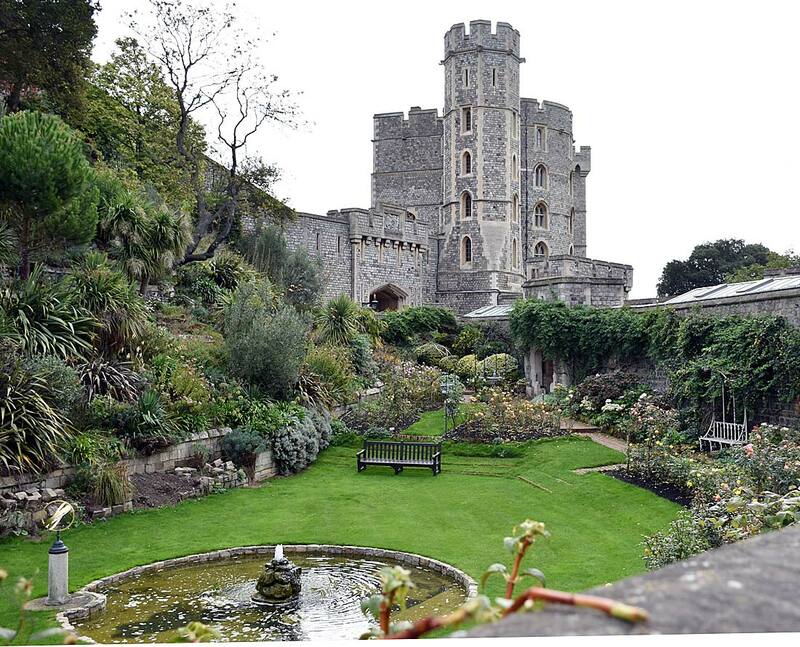 A former protective feature, Windsor Castle moat is now a beautiful garden. Purchase Windsor Castle tour tickets online prior to arrival to save time. Ticket price includes a great audio tour. We suggest budgeting three-plus hours once inside the castle walls. Windsor Castle is full of fascinating objects, astonishing rooms and wonderful works of art. Mornings tend to be more crowded than afternoons. One of our tour highlights was the changing of the guard, which occurs at 11 a.m. most days (check the website for schedule, as it may vary). The guards march through Windsor town into the castle, where the guard change takes place. Your ticket includes various buildings in the castle walls, including wedding site, St. George’s Chapel. The chapel is still an active church with three or more services daily. Changing of the guard at Windsor Castle. The wedding is on a Saturday, breaking tradition of royal weddings being held on weekdays with a local holiday being declared. So folks won’t get the day off, but another royal wedding tradition continues: The pubs are allowed to stay open later Saturday night so folks can celebrate the occasion. Prince Harry will walk down the aisle of the same church that his mother, the late Princess Diana, carried him down to be christened. Only 600 guests are being invited to the wedding of Prince Harry and Meghan Markle. We say “only” because brother Prince William had 1,900 guests at his Westminster Abbey wedding and mother Diana had 3,500 guests attend her marriage to Prince Charles. St. George's Chapel sits inside the walls of Windsor Castle. The 75 West Window stained glass panes were removed in 1940 to protect them from German bombs. 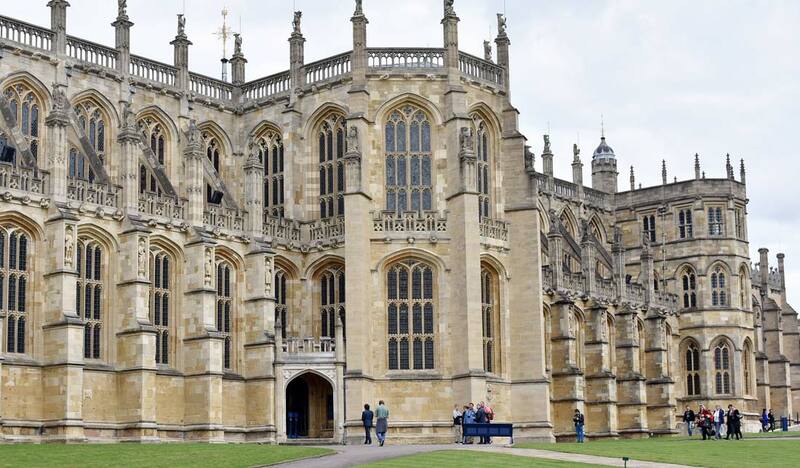 Located within the walls of Windsor Castle, St. George Chapel’s location allows the couple privacy for the wedding and reception to follow. This doesn’t mean you won’t get a view of the couple without a wedding invite. 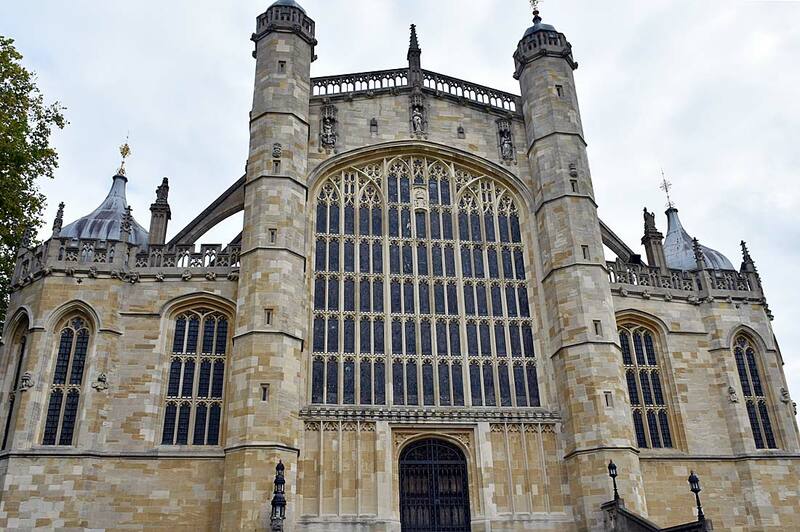 Following the ceremony, they will tour the streets of Windsor by horse-drawn carriage, including a procession down the Long Walk, a three-mile avenue that was once the royal hunting grounds for Windsor Castle. Other recent weddings at St. George’s include blessing of the civil marriage of Prince Charles and Camilla Parker-Bowles (a church wedding was ruled out because they were both divorced) and the wedding of Prince Edward (Queen Elizabeth’s youngest son) to Sophie Rhys-Jones, now the Duchess of Wessex. St George’s Chapel is one of the finest examples of Gothic architecture in England. Construction of the present chapel began in 1475 under the reign of Edward IV. The chapel’s West Window is believed to be the third largest stained glass window in England. The window’s 75 panels were removed in 1940 to protect them from German bombs. Within the chapel are the tombs of 10 monarchs. Henry VIII and his third wife Jane Seymour, the mother of his only son, rest under the chapel floor. George’s is home is home to Order of the Garter, the world’s oldest order of knighthood in continuous existence, with a history stretching back to King Edward III in medieval times. It is said that the king was inspired by tales of King Arthur and the Knights of the Round Table. Enjoy this article? 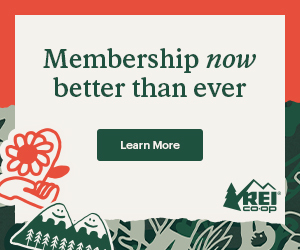 Click here to sign up for our e-newsletter and receive similar stories once a month!